Besides large slaughterhouses and meat packing companies, smaller butcheries are also among our customers. Wastewater of this kind of industry contains high freights of fat, solids, BOD and COD. Heavy pollution surcharges must be paid for such freights. For this reason it is often economical to reduce the freights on site to such an extent that the pre-treated wastewater can be discharged into municipal sewers without surcharges or directly into receiving waters. In cooperation with our clients we successfully develop and implement customized solutions for their specific wastewater and waste problems. Wastewater from livestock vehicle washing contains not only faecal matter, but also straw and saw dust. We remove such solids with our Screw Screen. The screenings are washed, in order to return faecal matter into the wastewater, and then dewatered and compacted to a solids concentration of at least 35 %DS; they can be incinerated as solid waste. Where cattle are slaughtered, 35 to 50 kg of paunch waste is generated per animal; it has a water content of about 90 %. Our Coarse Solids Compactor reduces its volume by 50 – 60 % and increases its solids concentration to 20 – 40 %DS. Wastewater from the butchery contains much blood and fat. We pre-treat this flow with our Wedge Wire Screen; the wedge wires usually have a spacing of 1 mm. After intermediate storage for flow and freight equalization, we treat the wastewater further in a HUBER Dissolved Air Flotation Plant (DAF). Depending on the specific requirements, the wastewater is first chemically conditioned (by precipitation, coagulation, flocculation and/or neutralization) within a tubular reactor. The DAF effluent can be discharged into the municipal sewer. For further full-biological treatment we provide a HUBER Membrane Bio-Reactor. Its effluent can be directly discharged into receiving waters. 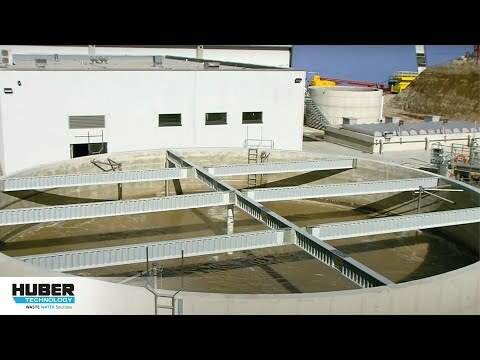 The permeate effluent is of outstanding quality and virtually disinfected, also permitting its reuse as process water. Waste activated sludge, consisting of biomass generated by biological treatment, is concentrated in our Disc Thickener and then blended with the already thickened flotate sludge from the DAF, mainly containing fat and coagulated blood. The blended sludge is then dewatered in our Screw Press. The dewatered sludge cake and the compacted screenings from the wedge wire screen are preferably supplied to a biogas plant in order to increase its gas production.